Change in the Uses of Urban Public Spaces by Cairo People (With a special focus on public gardens). International conference, on October 22nd-24th, 2004 in Beirut, Lebanon/The Social Science Research Council (New York) - SSRC Program on the Middle East and North Africa/The American University of Beirut - Center for Behavioral Research at AUB. Go to the Congress web site. or to the Beirut Conference Panels. The uses of urban public spaces in Cairo have undergone a profound transformation over the last four decades. 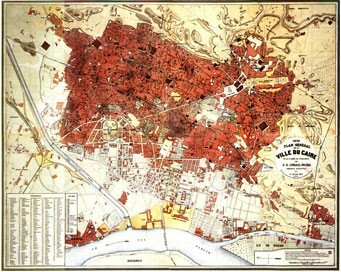 Beginning with the reign of Muhammad Ali and continuing under khedive Ismail, a Haussmannian model of urbanization and gentrification prevailed. Until the 1960s and 1970s, these modernized urban spaces (found primarily in the new downtown area) can be defined as the location of a bourgeois public. In Wast el-Balad (downtown) Haussmannian architecture was a key site for the articulation of new “modern” spatial practices, identities, and sociabilities. This new downtown was to provide a kind of display window of Egyptian modernity. Since the 1970s the meanings, uses, and publics associated with modernist urban space have undergone a radical inversion. Talaat Harb Street, for instance, has become a popular paseo and public gardens like the Giza Zoo are a favorite place to have a baladi picnic on the grass. Such spaces, once the showcase of Egyptian modernism and civility are no longer places frequented by elites or associated with elite culture. The old bourgeoisie today is déclassé, replaced by the upper class created by infitah (Sadat’s liberalization), which is now more or less confined to clubs (nâdî) and gated communities in the surrounding suburbs. As a result, urban public spaces are increasingly being claimed by new sorts of publics engaging in new sorts of spatial practices. With such a radical transformation of the public space, is there a concordance of the dispositifs of the space and the dispositions of its Cairene public? How do various publics use the space today? What kind of city-show is built? What kind of control is exerted over public spaces and by whom? At first, it is a distant murmur melted in the confused hum of the traffic. The acoustic level does not increase for such a small thing; the random-like symphony of horns is going on. However, it is this sort of signal with no misunderstanding about it. All heads in this upper part of Talaat Harb Street turn to the source of this murmur. A fellow runs quickly from a sidewalk to the other one, crosses the street through the perpetual traffic jam, forces his way through the crowd, but not enough quickly. There were four or five other guys running after him. Now, as by magic, they are twenty, swiftly fifty men overtaking him. As soon as the fellow is caught, a masculine crowd surrounds him, slates him, and starts to mistreat him. The more external persons of the circle push themselves as a centripetal force. They do not even know what is happen in the inner part of the circle, and do not know why the runaway disserves that: they push, actually for these reasons. They want to know and before knowing what, should the occasion arise, they can help other peoples the answer: “haramy!” (a thief!) At this stage, the entire street is aware of the “incident”, and more and more people arrive to intervene, to form, and to express their opinion. At this point, teenagers whistle at their peers: they gather, even run to literally jump on the circle. The point for them is just adding ambiance, and having fun of this opportunity. In the inner circle, the person at fault still makes useless attempts to extricate him from the situation. Some people seem more concerned by the dispute and do not want to drop the shirt of the so-called thief. Others try to calm down the whole situation: a part of them tries to separate the belligerents taking the thief aside, the other part tries to cheer the likely victim, by kissing him, seizing him round the waist, showering him with “maalesh” (“doesn’t matter”). The whole circle, a dense pack of gesticulating bodies, moves by its own force of inertia during two, three long minutes, slipping from the sidewalk to the middle of the street (paralyzing definitively the traffic). Suddenly, two policemen in uniform and one in plain clothes (appearing from nowhere) split the mob, and collar the fellow (who is at that time half sheepish half protesting his innocence). The police officers take him away with the authority of their duties, followed by a crowd, which will scatter slowly, with some few guys still trying to kick or punch the (now) prisoner. They pass by other policemen, who have not give a slight move to intervene in the street dispute, but a smile for the situation (they are responsible of the traffic only). (September 2004, Downtown Cairo, 21:00 pm) Collective reaction for a lonely deviant behavior. Involvement of the bodies of a large body of people before the forces of the law and order. 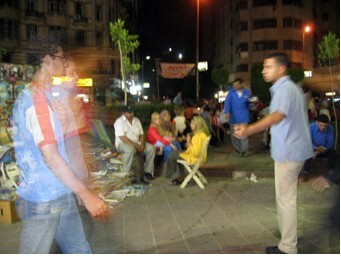 Has this sort of scene always taken place in Wast el-Balad (Downtown) of Cairo? Is it a chic attitude for a chic district? This article has been read 605809 times. Dernière mise à jour de cette page le Monday 26 December 2011 à 22:49:35. //// -----> Citer cette page? Vincent Battesti, "Change in the Uses of Urban Public Spaces by Cairo People" [en ligne], in vbat.org anthropoasis, page publiée le 22 October 2004 [visitée le 22 April 2019], disponible sur: http://vbat.org/spip.php?article9.